I don’t know about you but I’m signed up to a stupid number of email newsletters! Most of them I delete straight away without reading but there is one newsletter in particular that I even look forward to and it comes every week on a Tuesday. The company is Share Creative (the brilliant people behind the fantastic EasterLIVE project). They have a weekly email newsletter that they describe as ‘a weekly email to inspire and inform you’ and for my money they achieve that every week! 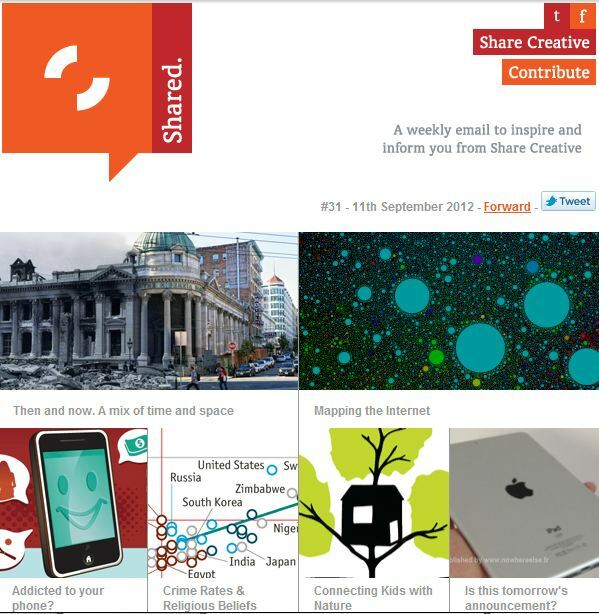 I think anyone who wants to use email marketing in this way could take a leaf out of Share Creative’s book. They use Mailchimp for managing the newsletter – a free and brilliant tool for anyone wanting to use email marketing – great for charities especially. You can subscribe to this brilliant newsletter here. Very creative. We use mailchimp as well (though not quite done as well!) each week. I do think that it can depend on who you are focussing on as to whether this style works best or not. I suspect for our parishioners they would prefer to just read the text (or maybe that’s just me trying to convince myself! ).